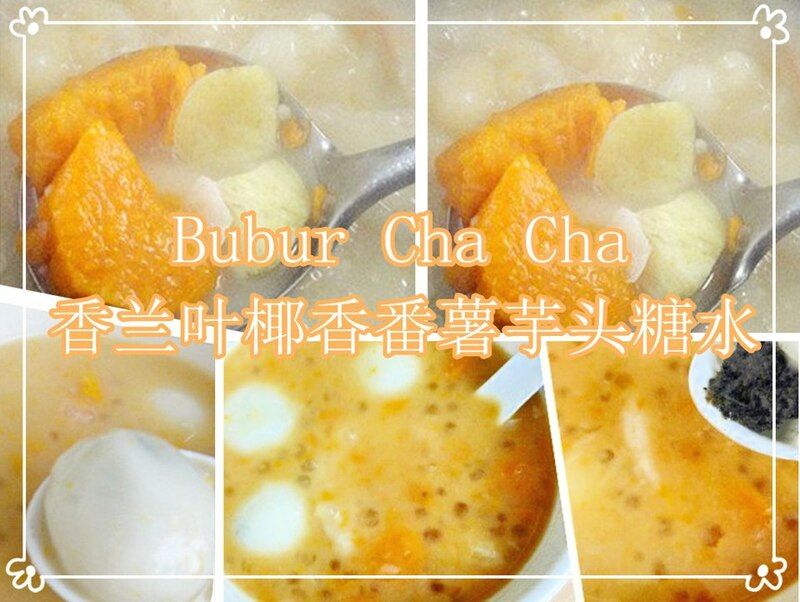 This Steamed traditional Chinese rice pudding Put chai ko is typically made of rice flour is delicious and healthy perfect to eat. Sometimes I like to dressed up with a little shredded coconut or red bean paste. I have a deeply passionate love for this traditional rice pudding. It's a lovely and easy to make. Now, you get to measure out your hot water in 200ml and dissolve 40ml sugar into hot water. Then, 40ml rice flour, and 20ml wheat flour. Combine together in another bowl. Mix in ingredients A into the flour mixture and strain. Pour this solution into the moulds/small bowls and steam with high heat about 20 minutes until cooked. Leave to cool. You can remove and coat with coconut before serving. Tapioca Starch 泰國生粉 can be substituted for Wheat Starch 澄麵.Use a skewer inserted into the centre of the rice cake, they must be comes out clean. Sweet potatoes are a great source of vitamin A and fiber. 1) Add 1 cup 250ml of the flour with 1 cup 250ml of cold water. 2) Heat up the oil in a large pan to 180°C. Dip your sweet potato slices in the batter, then fry until golden and crispy, Serve with a cup of green tea. garlic is an herb. It is best known as flavouring for food. 1) Cook the spaghetti as per the instructions given in the pack. Boil the spaghetti with a tsp of oil and required salt, till soft about 10 minutes, I like them a bit softer and chewy. drain out the water, and rinse it in cold running water to prevent sticking together. 2) Meanwhile, heat oil in a non-stick frying pan over medium-high heat. Cook garlic in oil for 1 minute. 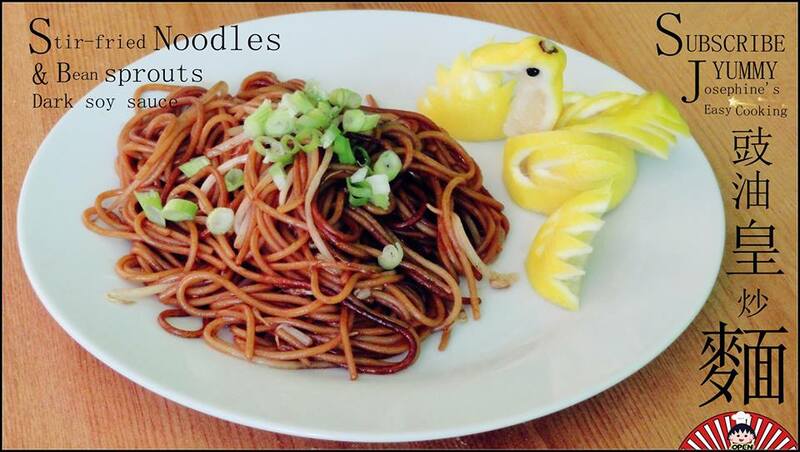 3) Add the soft spaghetti, and add sesame oil, light soy sauce, and then add bean sprouts continue over high heat to fry, and add dark soy sauce, oyster sauce, maggi liquid seasoning stirring for 2-3 minutes. Lastly add spring onions and add chili, if you like a bit spicy. Then serve immediately and enjoy! Top secret recipe from my experiment. 1) Wash and clean the pork shoulder, add marinate and covered with plastic wrap. allow to sit in the fridge for overnight. brush both sides with clear honey and flip over to roast them each side. until the pork are glazed, and tender. 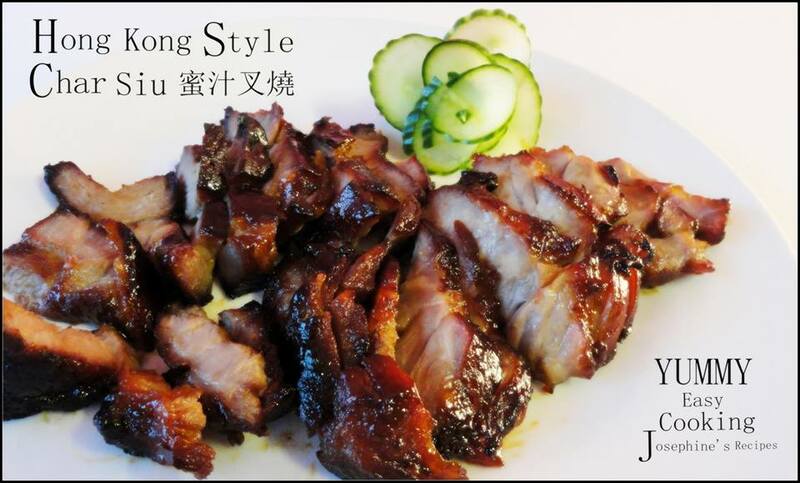 Chinese-style spareribs, also the ribs were awesome, so juicy and flavorful. This is really a great recipe. it is simple that I used and I loved it. Absolutely delicious! 1) Marinate the pork ribs with spare rib sauce, covered with plastic wrap, and sit in the fridge for overnight. 2) Preheat the oven to 200°C, Prepare the aluminum foil, add the ribs and bake for 20 minutes. then brush both sides of the ribs with the honey and sprinkle over the black sesame over the top, bake for another 15 minutes. Transfer ribs to a serving plate. 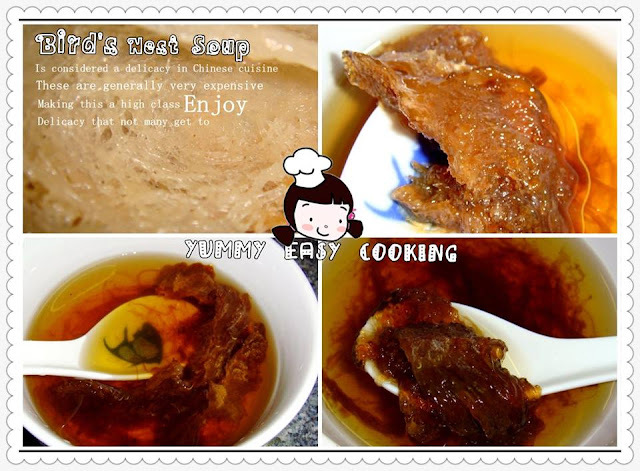 Bird's nest soup - It is good for your skin and health and will keep you looking young. 1) In a bowl, add the bird's nest and clean water, soak for overnight. Remove the black spot and pick out any loose feathers. 2) Use a slow cooker or double boiler to cook the bird's nest for about 3 hours. 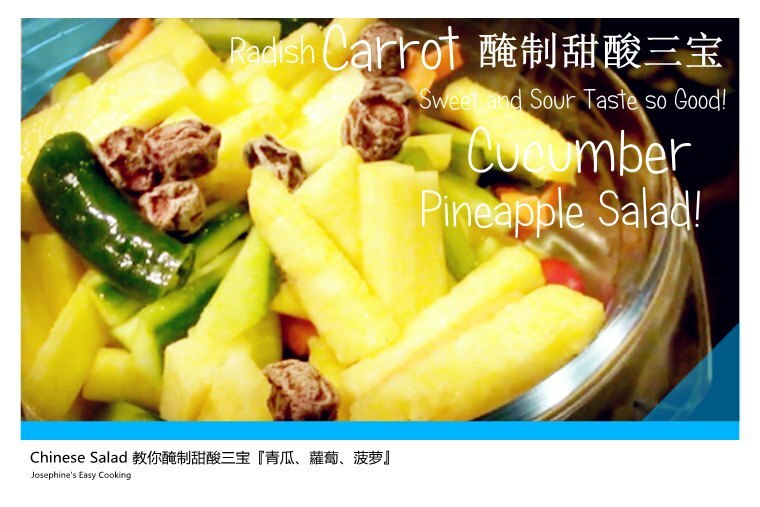 In a casserole, add clean bird's nest, water, and ginseng slices. before serving, add rock sugar to taste. 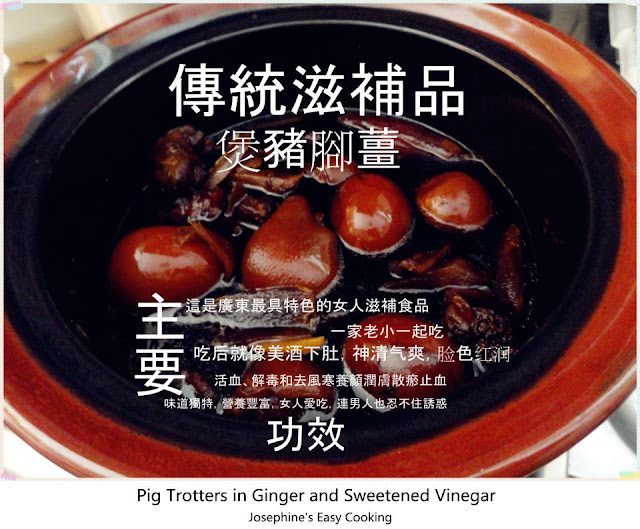 You can use red dates instead of the ginseng slices, or even without them. The taste of the bird's nest soup are heavenly, sweet, chewy textures, and smell like egg whites. It can be served both hot and cold. 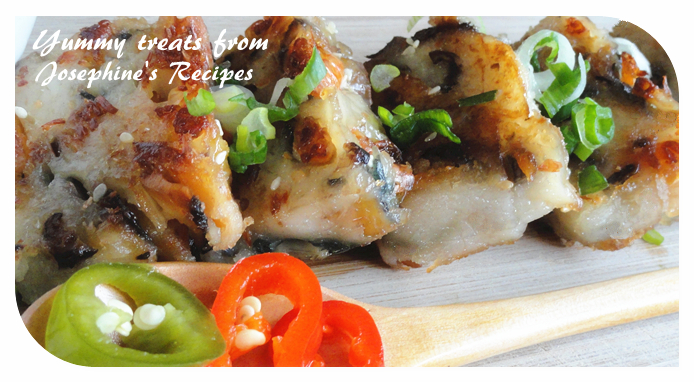 My favourite way as an appetizer, mouth watering to serve them with rice and dipping sauces. 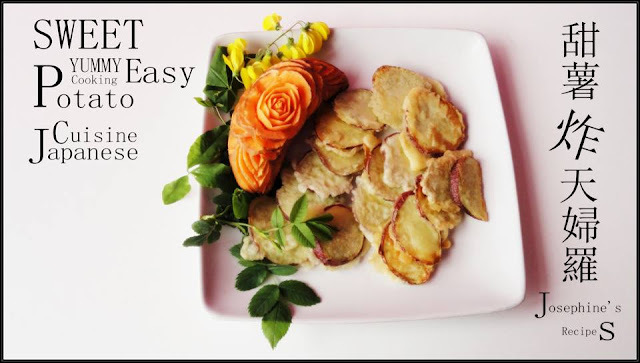 This is one of the easiest way to pan-fried salmon and It’s also one of the tastiest. to satisfy your taste buds. black pepper and soy sauce and mix well. 2. Heat the oil in a large non-stick frying pan over medium high heat. Add ginger slices, one at a time, dip salmon pieces into corn or potato flour, making sure each piece is well coated. 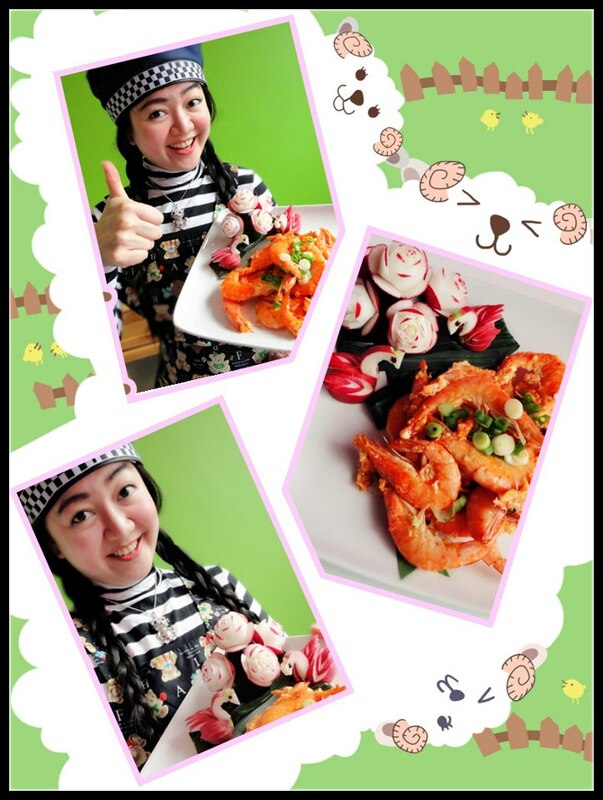 There are 3 colors of steamed rice cake is delicious and healthy perfectly to dressed up with a little shredded coconut. First, Prepare 3 separate large glass cup or large bowl for stir and mix. 1) Mix separately in a glass or bowl with ingredients A, B, C. Stirring constantly, then strain through a fine mesh strainer to remove any lumps. 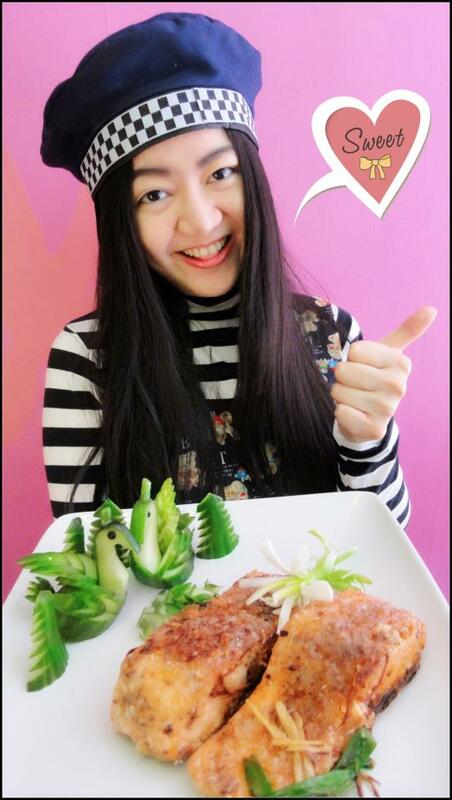 2) Prepare a cake mold that has been smeared with cooking oil. 3) Turn the steamer to preheat and allow enough water to boil, Pour each batter about 4 tablespoons of one layer steam for about 15 minutes. Once the first layer is firm, you can add the second, and third layers. 4) Adjusting the batter mixture and steaming each layers. also be sure to add a cup of water to the pot from time to time, ensuring it doesn't boil dry until cooked through. 5) Please use a skewer inserted into the centre of the steamed layer cake, they must be comes out clean. Remove and leave it cool, before cutting to serve. 1) In a saucepan, slowly pour milk, coconut milk, evaporated milk and pandan leaf. 2) Melted gelatine until dissolved, add sugar and condensed milk. Stir intermittently. 3) Cook over low heat, whisking constantly until thickened. 4) Strain coconut milk liquid through a fine mesh strainer to remove any lumps. 5) Cover with plastic wrap or kitchen paper placed tightly over the pudding. This will keep a skin from forming as the pudding cools. Put them into the refrigerator, and sit for overnight. 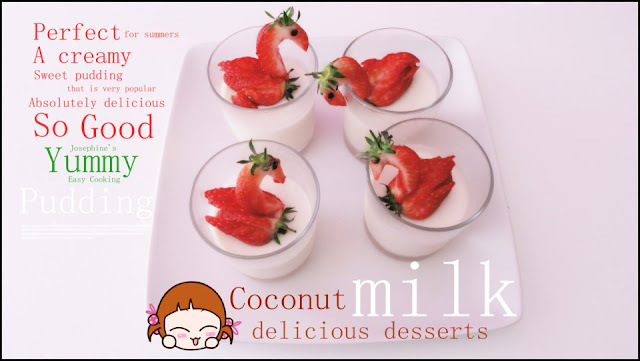 This is a really smooth and soft coconut pudding which is great for dessert. Serve and enjoy! Heat reduce to low, if milk gets too hot, bubbles over before you even know it has happened. Use a low heat and ignore the temptation to raise the heat to cook it faster. 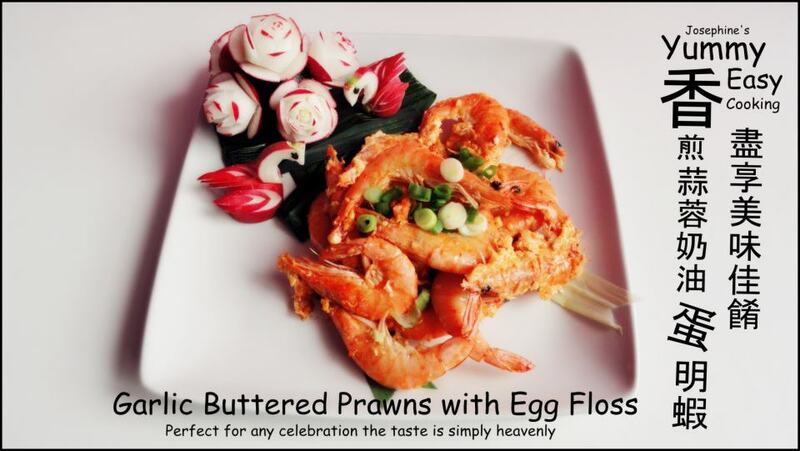 Learn How to Pan Fried Garlic Buttered King Prawns with Egg Floss Will give you a smarter start to the day. The best, quick, easy and very good delicious recipe of butter. I love eating this very much. 1) Heat up a wok with 1 tablespoon butter and melted. 2) Add chopped garlic until it turns golden. 3) lower the fire, Continue with prawns, Keep stir and add a pinch of salt until fragrant. 4) Switch to lower heat and add the mix with eggs. 5) Give them a toss. After a few second, you will see the mixture becomes foamy, It turns crispy look-alike, and into floss. Transfer to plate and 2 tablespoon light soy sauce to taste. 1) Sprinkle a pinch of salt into clean water, and soak the chicken wings for a few minutes. Clean and rinse well. Use a sharp knife and cut into pieces, and marinate with cornflour, sherry wine, white pepper, light soy sauces and maggi liquid seasoning, cover with plastic wrap and place in the fridge overnight, or at least 15 minutes. 2) Heat a wok, add sesame oil, ginger and chicken wings until golden brown. Once aromatic, flip over, add the seasoning, and allow the chicken to simmer for 25 minutes. Serve immediately. It is important that the chicken is cooked through to the bone. Use tongs to turn the pieces over a couple of times until they are deep golden and really cooked through. 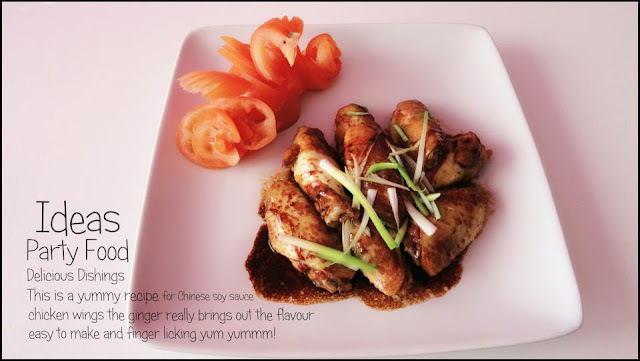 Perfect meal ideas that everyone are sure to fall in love with that. This simple baked salmon recipe is perfect for a weekday but could also fill in for a special occasion. It's brightly flavored and quite delicious. When baking the fish, be careful not to overcook. For moist salmon, bake until the salmon is barely done at the thickest part then remove from the oven cover with foil and let rest. A wonderfully moist and delicious baked salmon dish fit for everyone. 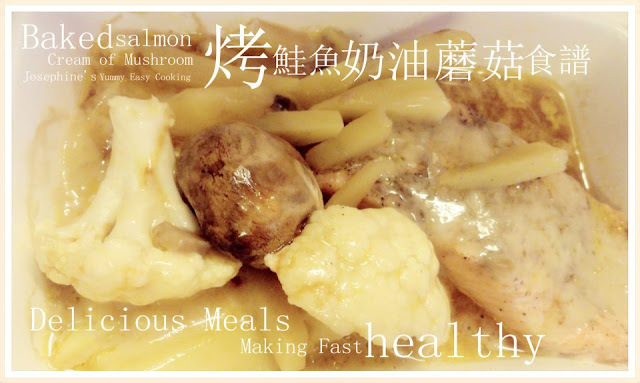 1) Place mushrooms, cauliflower and salmon in the baking dish with butter. and bake for another 30 minutes until tender. before serving, add light soy sauce and wine to taste. Once you've learned this recipe and follow step by step instructional video and techniques, you will amaze yourself and impress to your friends and family. 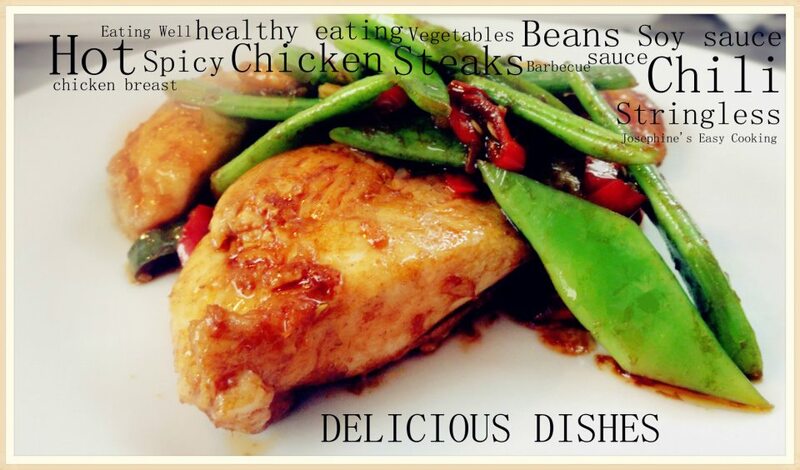 1) Add a pinch of salt over the chicken breasts, clean and wash thoroughly. Marinate with 1 tsp soy sauce, black pepper and 1 tsp corn flour. Combine well and Set aside. 2) Heat a wok, Add the vegetable oil, ginger and chicken steaks with 2 teaspoons bull head barbecue sauces and stir fry for 3 minutes on both sides or until golden brown. (being careful to not burn the oil). 3) Add a green, red chili and stringless bean fry until translucent. 4) Add 2 tsp light soy sauce, 1 tsp dark soy sauce and 1 tsp maggi liquid seasoning, Stirring continuously until fragrant. Remove from heat and Spoon into dishes and serve with hot rice. 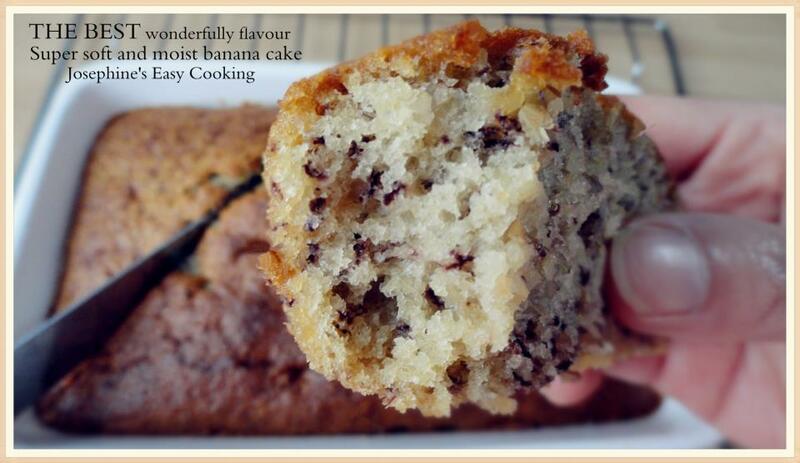 The best banana cake ever. Just like your grandma used to make! 1) Cream butter and sugar in a mixing bowl. 2)Add in milk, horlick powder, eggs and mix well. 3) Add mashed banana into the mixture and mix well. 4) Finally add in sifted flour. 5) Bake in preheated oven at 200 degree C for 35 mins to 1 hour after then use a skewer or chopstick inserted into the centre of the cake, they must be comes out clean. if the top layer turns brown after 15 minutes, cover it with a piece of aluminium foil. Set aside to Cool completely. Use a sharp knife to slice and serve. Simply want to amaze yourself? Just go for it and give it a try! Day01: The flat surface of the cake is so crispy, inside were real moist and soft. Put in microwave for 30seconds on heat. Whatever, just as you like. The cake that came out was soft, rich and moist. 1) Cut the pork into 1-inch cubes. 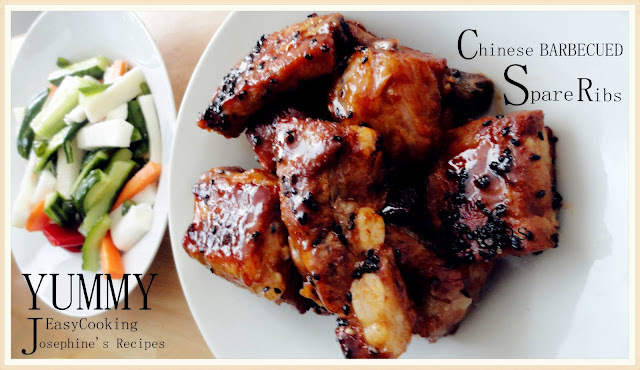 Marinate in the soy sauce, white pepper and cornstarch for 20 minutes. 2) Heat the oil for deep frying to 375 degrees Fahrenheit. 3) Combine the flour and cornstarch. Stir the egg white and vegetable oil. Add as much of the warm water as is needed to form a thick batter. 4) Dip the marinated pork cubes in the batter. Deep-fry in batches, taking care not to overcrowd the wok. Deep-fry the pork until it is golden brown. 5) Remove and drain on. you can deep-fry the pork at second time to make it extra crispy. Make sure the oil is back up to 375F before you begin deep-frying again). 6) Heat the wok, over medium high heat, add the pineapple syrup in juices and vinegar, sugar, salt. onion, tomatoes, green and red pepper chili and pineapple chunks, ketchup, dark soy sauce. then cornstarch mixture with sauce, and stir well. check the sauce one more time to adjust seasonings if desired. 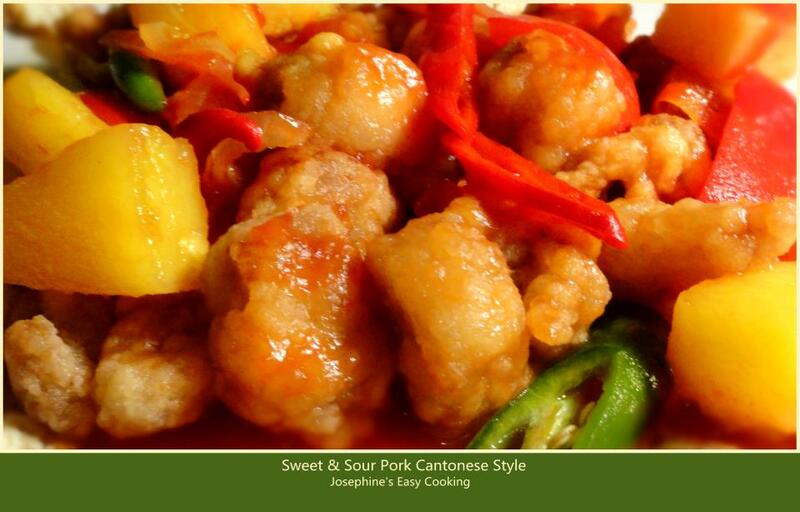 Serve the sweet and sour pork over rice. 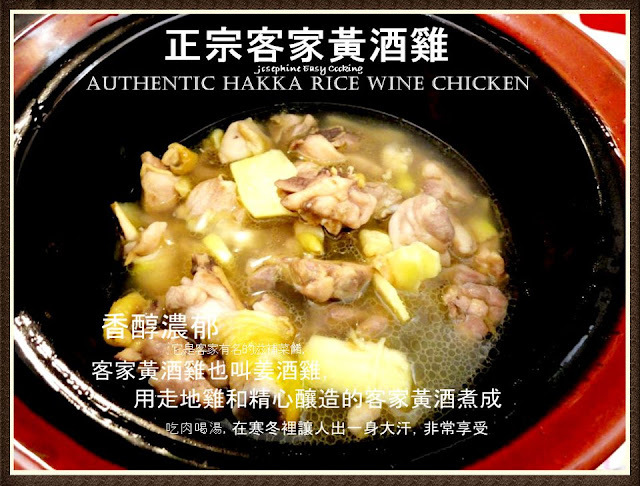 Please attention: Rice Wine after cooked, it will be reduced alcohol and increase nutrient. some pregnancy women can drink for healthy some are not, so please ask for doctor advice. weakness ill, ideal food for elderly, and pregnancies, maternal ... heat health food. 1) Heat the wok, add sesame oil and fry the chicken pieces until golden brown. 2)In a large casserole, add rice wine, and sliced ginger to a boil. once boil out the ginger rice wine, and add the chicken, and season with salt, oyster sauce and sugar and continue to cook for another 15 minutes until the meat is tender, before serve, add some rice wine, brandy or dom benedictine for keep the alcohol strong and keep all the amazing flavor in the upper level. 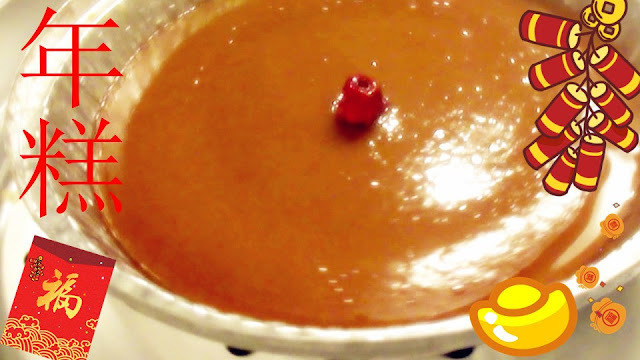 1) Put sugar into a small pot and melt the sugar under low fire until golden honey brown (you can caramelize it further but the cake will have a slight bitter taste) without stirring. Add the water carefully because it will sputter. Let sugar water (very watery, not syrupy) set aside to cool. 2) Add eggs and beat well, cream butter, sweet condensed and evaporated milk in high blend then placed in has a good tune. sift the plain flour, bicarb soda, baking powder and mix well. Cover with plastic wrap and let stand at room temperature at least half hour. After then, add the sugar water into the batter and stir well to mix together. cover and stand at room temperature at least 1 -3 hours. 3) Switch oven on to 220c, for the first 15 minutes, after turned to 200c about 45 minutes until light golden brown around the edges. Test with a bamboo stick or chopstick test to see, which should come clean if cake is done. If not, give it another 15 minutes or more. Some ovens are hotter, some cooler, so you just have to know your oven and adjust it yourself. 1) Peel and cut sweet potatoes and taro into chunks of desired shapes. 2) In a large pot, Add in sweet potatoes, taro and pandan leaves. 3) Filled with water then start boiling. Turn heat to medium, continue boiling for about 40 minutes. Exact cooking time: As it depends on how thick you have cut the potatoes and taro. 4) Finally, add 1 cup of coconut milk , brown or palm sugar and sago for simmer about 10 minutes. 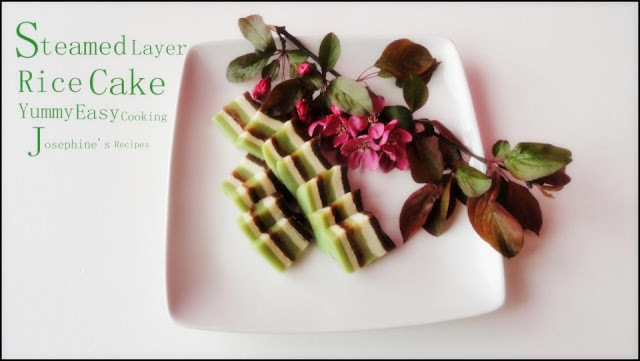 5) Turn off the heat, Removed pandan leaves and serve either hot or cold. 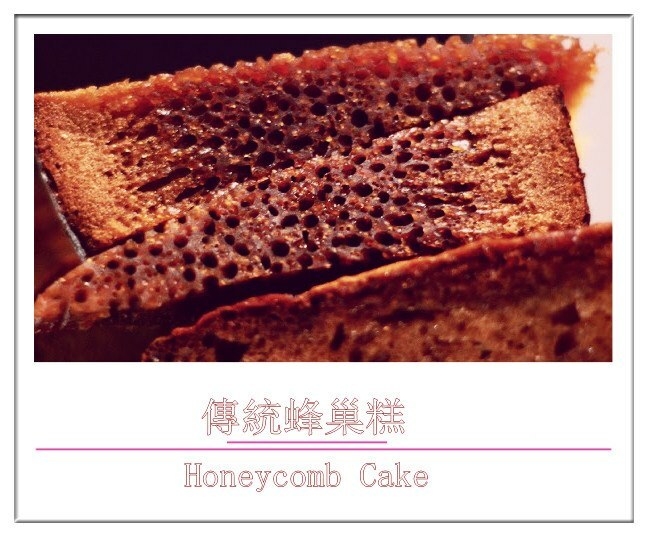 This is the delicious savory cake served in dim sum restaurant throughout the year and, most auspiciously, on New Year’s Day as a symbol of prosperity and rising fortunes. First, two deep round steaming tin. Please don't add too much water, while you cook the radish as the vegetables will release enough of its own juices. 3 tsp vegetable oil - add more oil if needed. 1) In a big bowl; mix the 1 cup rice flour and 5 tsp corn flour, Add 1 cup of water soaked with (dried shrimps, dried scallops and dried mushrooms) to make a thin batter. 2) Heat and add vegetable oil for stir fry red onions, dried shrimps, dried scallops and dried mushroom until golden brown. 3) Add Chinese white radish and Seasoning to taste till well combined. 4) Cover and cook until tender and translucent, about 15 minutes. 5) Using the same wok, Pour in the batter and cook on low fire till the batter slightly thickens, roughly about a few minutes. Stir well and pour into the steaming tin. Pour thick batter into a well-greased steaming tin, This should take and steam for 1 hour. Remove from heat and set aside to cool. Cut into pieces. Heat a pan over a medium high heat, Add 3 tsp vegetable oil. 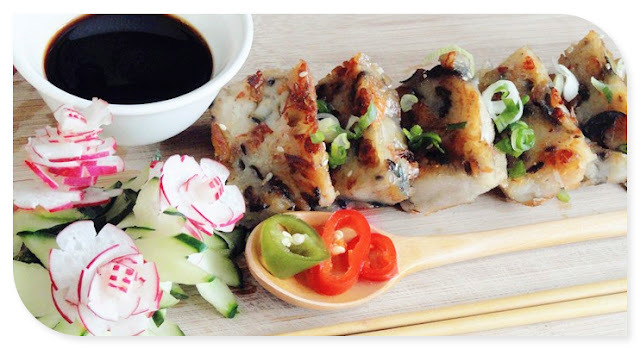 Transfer turnip cake slices one by one to a pan. Heating slowly until both side is golden brown. Serve hot with your favourite dipping sauces. After pan-fried the outer skin is crispy and the inside of the cake is soft and nice. and mushrooms can be increased or decreased to suit your own taste. 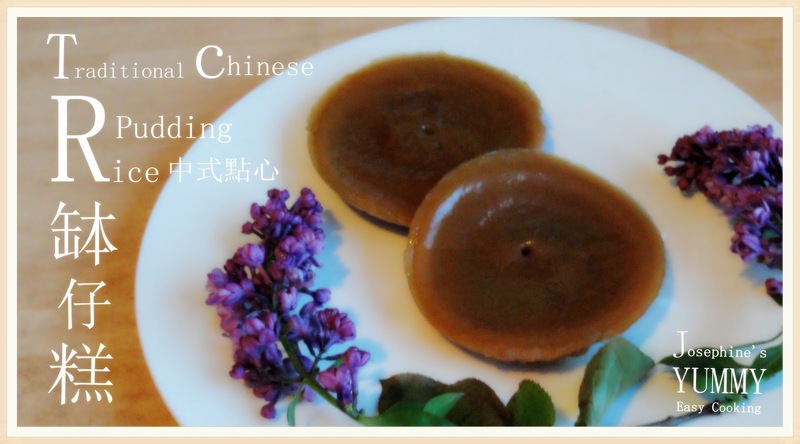 Steamed taro cake made with yam and rice flour. 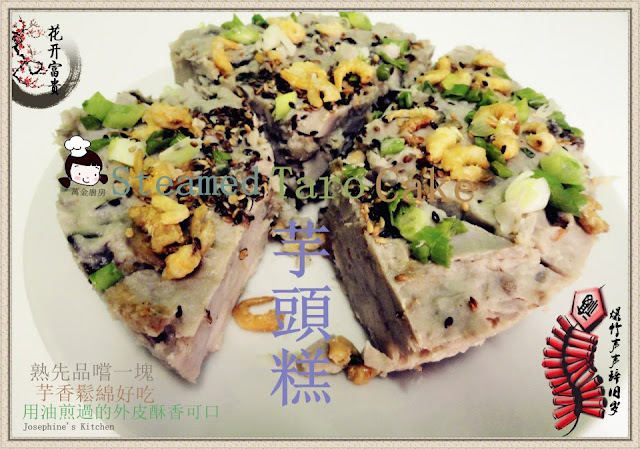 It's many peoples of dim sum restaurant favourite, chinese radish turnip cake (lor bak gou), which is more or less the same but it's made with yam instead of radish. both these savory cakes made in a similar ways. First, prepare two deep round steaming tin. If you only want to make for one deep round cake pan, just reduce everything's to half. and dried mushrooms (soaked / sliced). 5 tsp vegetable oil - add more oil if needed. 1) Heat 5 tsp vegetable oil and stir fry ( red onions, dried shrimps, dried scallops, dried mushrooms) till fragrant. Add diced taro and seasoning till well combined. 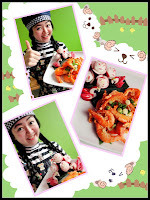 2) Mix 1 cup rice flour and 5 tsp cornflour with 2 cups water of soaked (dried shrimps, scallops and mushrooms) to make a thin batter and using the same wok, pour in the batter and cook on low fire till the batter slightly thickens, roughly about a minute. 3) Keep stirring the mixture so that the bottom wont get burnt. When the batter begins to thicken ( you will see probably one or two bubbling ) remove from fire. Stir well and pour into the steaming tin. 4) Pour thick batter into a well-greased round steaming tin. You can steam till cake is set and cooked through for 1 hour. Spread the garnishing on top and press lightly. Leave aside to cool. Heat a pan over a medium high heat, Add 1 tablespoon vegetable oil. Transfer taro cake slices one by one to a pan.Heating slowly until both side is golden brown. Serve hot with your favourite dipping sauces. After pan-fried the outer skin is crispy and the inside of the cake is soft and nice.